People are bringing flowers and candles to the St. Petersburg government’s office in Moscow to commemorate those who died in the metro blast. 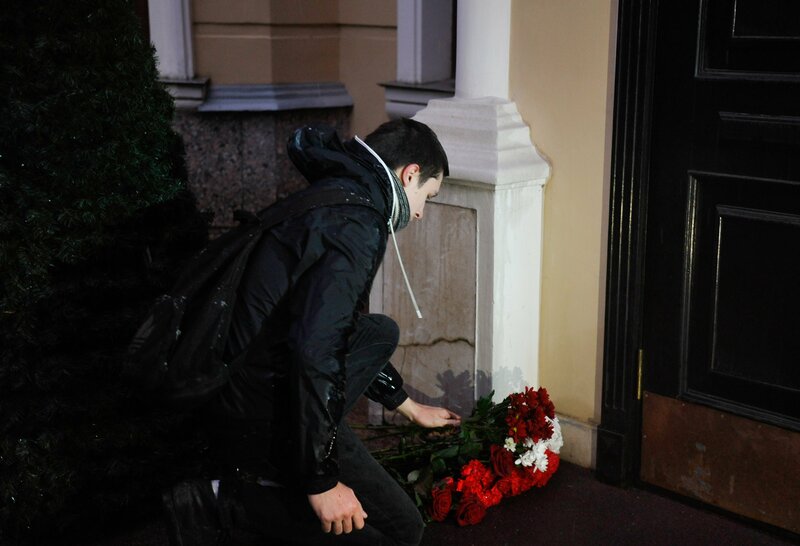 People have been bringing flowers and candles to the St. Petersburg government’s office in Moscow to commemorate those who died in the metro blast, a TASS correspondent reports. Red carnations and roses may be seen in front of the office building in Spiridonovka Street in downtown Moscow. "Tomorrow, at nine o’clock in the morning, a Book of Condolences will be open at the office so everybody will have a chance to convey their condolences," a source in the St. Petersburg government’s Moscow office said. the Tekhnologichesky Institut and Sennaya Ploshchad stations. According to the Health Ministry’s latest data, ten people died in the blast while another 37 persons were hospitalized with various injuries. Russia’s Investigative Committee has qualified the blast as a terror attack.Transport security measures have been tightened in Moscow. Moscow mayor Sergei Sobyanin conveyed his condolences to the families and friends of those killed.